If a skunk or a family of skunks has taken residence in or outside your home in Westchester County, Katonah, Bedford, Bedford Hills, Mt Kisco, Chappaqua, Armonk and Pleasantville, NY, you should contact a skunk removal professional quickly. Here is a guide that can help you get rid of a skunk infestation. Skunks can live under your porch, deck and shed. You may even find skunks living in your yard. They can also enter your home through the vents. What Damages do Skunks Cause? Skunks will use their front legs and sharp claws to dig around the walls of your house to create and access a den under your home. Vent screens also provide easy access to skunks. They slash or damage the vent screens to get inside. You need to contact Pinnacle Wildlife Control for skunk pest control immediately, as the skunk smell is pungent and strong and can permeate into your home. 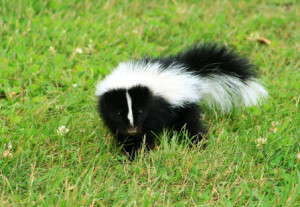 If a skunk sprays you, the smell can last for several days and weeks. Skunks can transmit rabies to people and pets. They can also bring in parasites such as tapeworm, lungworm, fleas, ticks, flukes, lice and roundworm. Their excrement contains harmful and dangerous bacteria. The decomposing body of a skunk can multiply the bacteria found on their body and cause infection if contact occurs with the mucous membrane or skin. Look under your porch, home, or shed and seal any entry holes you find. Install an exclusion barrier around the home and a one-way exclusion door to prevent skunks from living under your home. Use traps to capture skunks entering your yard. If a skunk falls down a window well, you can place a wooden board or plank to help them climb back out. Contact Pinnacle Wildlife Control to remove skunks and keep them far from your home in Westchester County, Katonah, Bedford, Bedford Hills, Mt Kisco, Chappaqua, Armonk and Pleasantville, NY.